The yeshiva was founded in Tel Aviv in 2000 with an aim to educate first-rate Torah scholars who have both a high-level of Torah knowledge and a deep understanding of and strong connection to the society and community in which they live. 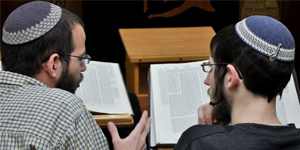 The curriculum is in-depth and comprehensive, with a focus on public rabbinical leadership studies, under the close supervision of the Rosh Yeshiva. Ateret Nehemiah Yeshiva serves a wide range of students - pre-army bachelors and post-army married students; soldiers, pensioners and community members. Specific curricula have been tailored for each of these groups of students. Midreshet Aviv for women is a unique program that has been operating in the heart of Tel Aviv since 1996. The midrasha's purpose is to provide a study hall with a warm, family atmosphere, for women who wish to learn Torah and delve into ideas based on Torah and Jewish faith. The midrasha offers a variety study programs that allow every woman, regardless of her age or educational background, to join the classes best suited for her - from a single weekly class to a full weekly schedule. The curriculum includes: Bible studies, Halacha, Chasidut, Midrash and Aggadah. At Midreshet Aviv women learn Torah as an integral part of life; that invites every woman to develop all her faculties: her intellect, for understanding; her heart, to feel; and hands, to take action. The study guides the women's growth and builds love of Torah and fear of Heaven, through close camaraderie and lively discourse in the study hall and beyond. The Midrasha is constantly engaged in activities for the benefit of the community at large - assistance to needy families on holidays, mentoring children, and more. All this happens in Tel Aviv, home of the amazing human landscape of Jews of all types, inviting us to meet with our brothers and settle in their hearts, and through shared life experiences and learning, to build a common society of tolerance and understanding. The goal of this project is to facilitate the successful absorption of Ethiopian Jews. Ethiopian immigration has posed a unique challenge to Israeli society, mainly due to the large differences between Israeli and Ethiopian society: in education, economic resources, culture, technology and family structure. These differences have caused the lack of proper integration into the labor market and complex difficulties in integrating into Israeli society. These difficulties have led to many problems among the younger generation: unemployment, violence, drugs, and social problems. Aviv HaTorah institutions have been offering solutions to the local Ethiopian community - about 2,000 families - since 1991, and launched Successful Aliyah in 2007. This project follows the development of a breakthrough approach that quickly attained significant achievements, including: the establishment of educational settings for children, youth and adults; a program to improve communication between family members; the establishment of an extensive social assistance network, and the establishment of a program to strengthen the immigrants' Ethiopian identity. These achievements have greatly contributed to the Ethiopian community and to Israeli society as a whole. Many people have tried and failed to assist the Ethiopian community, due to mutual trust problems and a lack of familiarity with this community's unique character and customs. We at Aviv HaTorah institutions have solved this problem through cooperation with Rabbi Yehudah Sahala, a veteran Ethiopian immigrant. We created a community in which Rabbi Yehuda Sahala serves as the rabbi, on behalf of the Israeli Chief Rabbinate, and he leads Aviv HaTorah’s projects in the community. The success of these programs is thanks largely to Rabbi Sahla’s understanding of and true partnership with the community's members. The projects that Aviv HaTorah has initiated in the local community are run in cooperation with the various departments of the Tel Aviv Municipality, and with experts in helping at-risk youth. · The establishment of a community center – the center hosts all the projects run in cooperation with and for the benefit of the community, including social and cultural activities and professional counseling and assistance. The Tel Aviv Municipality has committed to provide half the cost of the center, if we can raise the other half. The sum required - $ 150,000 (total cost $ 300,000). · Afternoon programs for children and youth – these programs include a hot meal, an attentive ear, and an emphasis on family values ​​and Jewish tradition. Annual cost - $ 70,000. · Community cultural programs – for strengthening the mutual connection and relationship between Ethiopian-Jewish culture and Israeli society. Activities include a communal Pesach Seder for some 1,500 community members. Annual cost - $ 80,000. · Family Assistance Center – in cooperation with the Tel Aviv Municipality. The center provides assistance in matters concerning education, economics, employment and health, as well as immigrant absorption programs – Hebrew language and introductory computer classes and Israeli culture programs. Annual cost - $ 20,000. · Economic Assistance Fund – financial support, the distribution of food parcels and shopping vouchers to hundreds of needy members of the community. Annual cost - $ 35,000. · Vocational Training Center – the center provides a variety of professional training in practical professions , that will help community members find work and improve their social integration. Project cost - $ 50,000. · Tattoo removal program designated to the men and women of the Ethiopian community. Project cost - $ 73,000. The daycare center, which is open to the entire Tel Aviv population, was founded in 2001, based on the concept and understanding that a positive dynamic between local religious and non-religious residents could become a reality through common educational settings. The daycare center has an enrollment of some 85 children, at least half of whom come from non-religious families. The center provides a loving environment, fostering relationships between the children and their parents, and is a model for a common society based on the values ​​of the Jewish tradition. The chain, which has six branches, was established in 2004, and serves the general public in the Tel Aviv area. The centers operate in cooperation with the Tel Aviv Municipality and their activities are held in municipal preschool facilities. These centers are unique in that they provide not only a warm and loving environment for the children, thus allaying the concerns of their parents, but also provide a quality educational setting that emphasizes Jewish values ​​and tradition. The Talmud Torah operates all year round in the afternoon hours and also in the mornings during school vacations. The Talmud Torah combines fundamental Mishnah and Torah studies with carpentry and sports lessons. The teachers at the Talmud Torah are carpentry and sports education professionals and married yeshiva students. This unique center was established in 1989 by the late Alex Kalit. The purpose of the center is to provide economic assistance and moral support to new immigrants and the needy, in the form of money and other necessities such as second hand clothing, housewares and furniture. The center provides assistance to about 5,000 individuals (1,500 families) who are referred to the center by the Tel Aviv Municipality's Department of Social Welfare. The center has 14 regular volunteer workers and dozens of others who help with regular activities. The volunteers are responsible for collecting and distributing clothing, housewares, and furniture, and assist in the distribution of food. Aviv HaTorah operates a fund that provides financial assistance to dozens of families each year, to cover basic, educational and medical expenses. The community outreach activities include workshops for parents on topics such as education and couple relationships, and programs for bar and bat mitzvah preparation. These programs are run in locations throughout Tel Aviv.